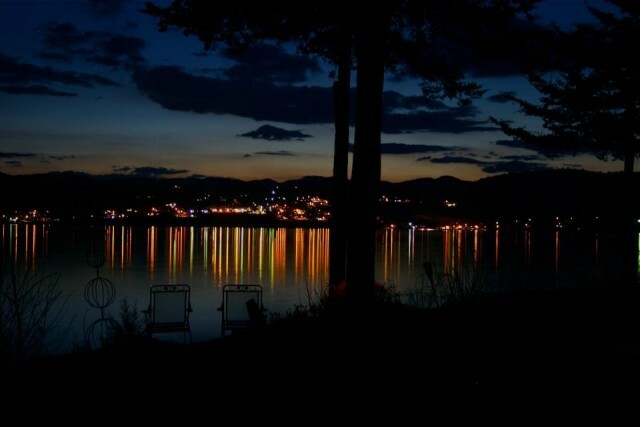 Port Henry and Moriah at night, viewed from across the lake. Photo by Jascha Sonis. Moriah's industrialized past is evident in its landscape and in its buildings. The level strip of land along the lake was suitable for cultivation, but Moriah's riches came from the superior quality of iron found in its hills. Moriah, was a boom and bust town. When the iron arrived, it turned Port Henry, situated on Lake Champlain, into a booming transport terminal. The railroad and Lake Champlain barge routes were established to transport goods to market. Until the great open pit mines of the west were developed, Moriah was a capital of the iron industry. In its early history, a mill was first built in Port Henry in 1766 with the first permanent settlement in 1785. In that year, William McKenzie settled in what is now the southern part of Port Henry. According to reminiscences printed in the 1873 Port Henry Journal, "he found no white inhabitants other than Mr. Lewis (the mill owner), but plenty of the St. Regis and Swagotchie (Oswegatchie) tribes. The Indians who came there to hunt remained all winter and sometimes through the spring; they were very friendly. Bear, deer, wolves, and rattlesnakes were then very numerous in this region". In 1804, there were still Indians living in wigwams at Moriah Corners, according to historian H.P. Smith and others who came to hunt. Timber harvesting and land clearing occurred at a great rate as there were 20 sawmills on the river between Ensign Pond and Lake Champlain in the first half of the 19th century. Docks were built at Port Henry as early as 1820. Lumber was rafted north to Canada, and, when the Champlain Canal opened, to southerly markets. The oldest iron bed in Moriah is the Cheever bed, located just one and one-half miles north of Port Henry. In its earliest days, settlers would go to the mine, pile the iron on to a sled and drag it back to town. The Cheever Bed's value was not appreciated until 1853 when it began to be worked seriously. A number of other small beds in that area also were worked for several years. Five or six large companies operated mines in the township, the best remembered is the Witherbee, Sherman Company, whose magnificent headquarters in Port Henry are now used for the town offices. Larger mining operations, that became Republic Steel, were centered in Mineville and Witherbee. Mineville and Witherbee were company towns. The streets lined with company houses constructed with blocks made from iron ore tailings still exist, as well as the extraordinary Catholic church built from the same material. Along with the mining companies came the railroad for bringing ore from Mineville and Witherbee to the main line at Port Henry. An aggregate of 230,000 tons was produced from the ore beds in 1868. In 1885, Smith wrote, "It is not safe to attempt to predict the future of the iron industry in this town; but it probably can be stated with confidence, that as long as coal can be transported here, and the ore transported from the mines to the lake with such economy the companies can compete successfully with the prices placed upon the product of other sections, so long will the industry thrive". Moriah attracted immigrants of many nationalities to work in the mines. It remains one of the most populated towns on Essex County. 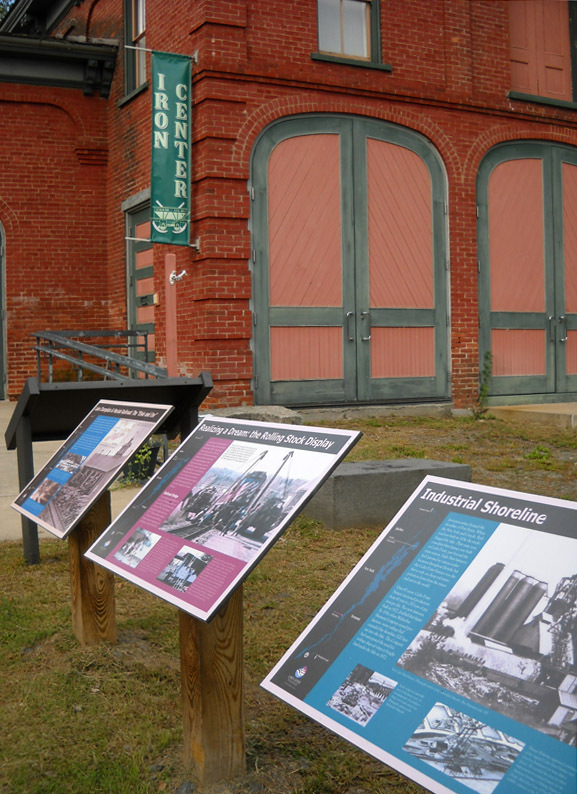 Moriah's industrial past is still evident, reflected in the industrial park located there today and in the tourist industry which is developing around the industries artifacts. The story of its mining past is being collected and exhibited at the Iron Center Museum in Port Henry and at the Essex County Historical Society in Elizabethtown. Links to issues of "The Fact Finder"